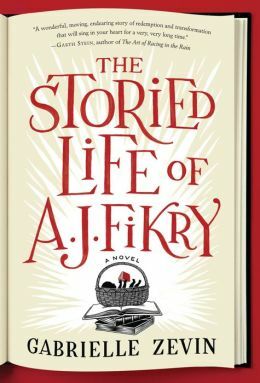 Gabriells Zevin’s The Storied Life of A.J. Fikry vicariously fulfills the dream of many readers to own a bookstore in a small town, where being able to read all day and talk about books, trumps profits. With clever references to familiar books and pithy quotes from favorite authors, Zevin offers a handy resource of good reads along with a quirky love story that will charm you as she follows a recognizable formula for second chances. Both A.J. and his wife, Nic, are literary beings who have forsaken the grueling years they could have dedicated to writing their dissertations to open a bookstore in a small town off the coast of Massachusetts, accessible only by ferry. After Nic dies in a car accident, A. J.’s life follows the usual pattern of despair – until two seemingly unrelated occurrences change his life forever: his valuable first edition of a rare Edgar Allan Poe book is stolen, and a toddler is abandoned in the stacks of the store’s children’s books. Zevin follows up with a slow-moving romance connecting A. J. to a publisher’s rep, a plot twist involving his dead wife’s sister, and humorous episodes as A.J. revels in his new role as father to the precocious young girl left in his store. The story has the pace and flavor of a “Major Pettigrew” or Beginner’s Greek, with characters who don’t fit the mold and a story line that easily moves from slight mystery to poignant moments and satisfying resolution, with lots of bumps along the way. The ending is contrived and not as happily-ever-after as you are led to expect, but I enjoyed this fast read about redemption through books – a good one for book lovers. 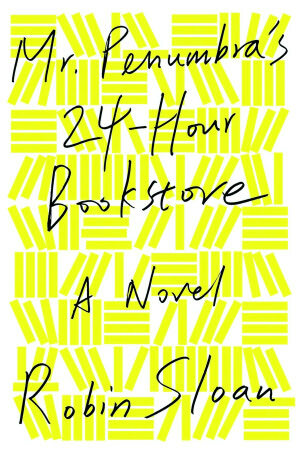 How could any reader resist this book title – the idea of a 24 hour bookstore is better than eating at an all-night diner. With a mix of fantasy and today’s world of digital magic, Robin Sloan creates an adventure of rivals – electronic books vs bound pages – in Mr. Penumbra’s 24-Hour Bookstore. Out of work computer geek, Clay Jannon, finds a new job on the night shift of a strange indie bookstore in San Francisco. Few customers want the books on display by Haruki Murakami, Neal Stephenson, and Dashiell Hammet; the attraction for his night visitors is the collection high on the dusty shelves in the back. Curious to understand the lure of these old books, Jannon digitally scans the log book and cracks a code that uncovers a secret society of readers. With the help of a new girlfriend who works for Google, Jannon follows the book store manager, Ajax Penumbra, to the headquarters of the Unbroken Spine group on Fifth Avenue in New York City – and starts the adventurous quest for a secret 15th century message that may be the key to immortality. Depends on how you define immortality…Sloan’s solution happily creates a balance of the new and the old that will please readers who like the smell of new book pages as well as the convenience of the Kindle. Mr. Penumbra’s 24-Hour Bookstore is a fun light read – all those familiar landmarks in San Francisco and New York City could lead you to believe that the adventure is real (I plan to look for the building across from Central Park), and the search for the puzzle pieces will keep you reading.